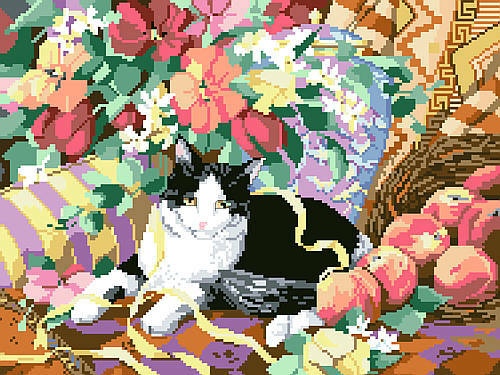 Portraying gentle charms, endearing qualities and irresistible sweetness, this royal pampered kitty reposes comfortably atop a soft, cushy sofa surrounded by fruits of the harvest. At day's end, the cares of the world melt away as this loveable kitty welcomes you home. Contents: Stitch Count 188w X 141h. Finished size on 10-ct 18-3/4" X 14"